I had great plans for Easter. I was going to bake one of those ridiculously sweet, fluffy coconut layer cakes to herald the arrival of spring. But, I’ve been felled by a wicked sinus infection. You know what they say about the best laid plans of mice, men and bakers. At this point, my only responsibility for Easter dinner is to show up, which is not the worst thing in the world, given how I’ve felt the past few days. Clearly, I am in need of the restorative powers of the season. While it’s not exactly a coconut cake, Spaghetti with Shaved Asparagus, found in the April issue of Everyday Food, is a bright and invigorating harbinger of spring. “The Field Guide to Produce” says asparagus is a perennial plant in the lily family (there’s an Easter connection already!) and wild asparagus was prized by the ancient Greeks and Egyptians as a seasonal delicacy. I used thin, wholegrain spaghetti to give the dish a nuttier flavor. The asparagus is shaved into strips with a vegetable peeler, so it takes almost no time to cook and is simply added to the pasta pot just before draining the hot water. 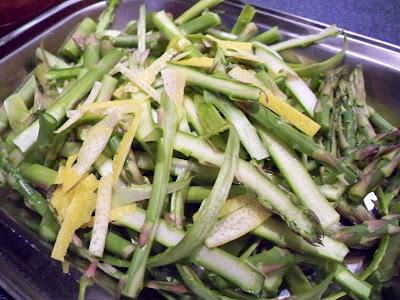 The asparagus shavings retain a crisp and vigorous, just-picked flavor. 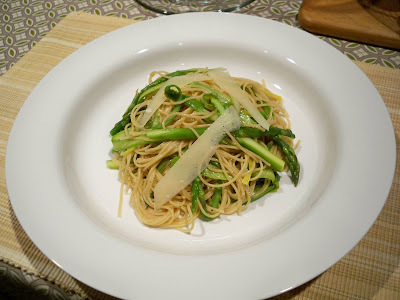 The spaghetti and asparagus shavings are tossed with lemon zest and salty-tart shavings of parmesan cheese. Asparagus spears grow underground. 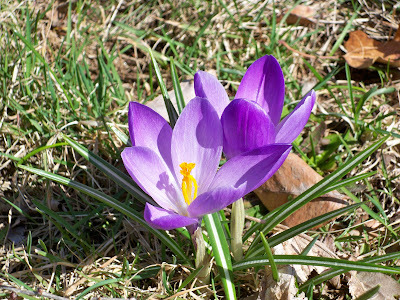 The tender green and violet shoots peak out of the ground in early spring, and are harvested by hand for about 6 to 8 weeks. With any luck, I may just be about ready to peak out from under the covers today, myself. Oh dear. So sorry to hear you aren't feeling well. Seeing a photo of a coconut cake would have been a treat for my eyes! I've been craving one, but I have not indulged in making one (for my first time). This dish looks simple, but so delicious. I love asparagus. The shaved cheese makes me drool. Hope you're on the mend very soon. 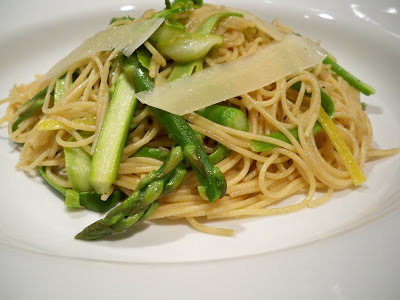 Your pasta looks great, and I love the simplicity of cooking the asparagus in the pasta pot. Sinus infections are awful and debilitating, so taking care of that is first order of business. Then you can figure out how to make it up to your family that they will be without a coconut cake for Easter. Perhaps a gift certificate for a future cake will do the trick! Those darn sinuses! Sorry to hear you're feeling under the weather T.W. That looks like a simple and delicious dish. I love asparagus! Have a Happy Easter anyway, if you can. You can bake that coconut cake next month. Sinus infections are the worst! I hope you're on the mend; feel better! The coconut can wait. In the mean time, I hope you had a great Easter! And, can we talk about how delicious that pasta with shaved asparagus looks?! Delightful! Hope you are feeling better soon. The asparagus and pasta sounds like a very tasty idea. I would have never thought to shred it. Oh T.W. , I hope you get better soon. A sinus infection is no fun at all. I love asparagus with pasta! They go so well together especially with that lemon zest with parmesan cheese shavings...YUM! What a clever idea to shave the asparagus. I have to feel really bad not to cook, so I hope you are better soon. Great meal, hope you feel better soon. Hope you feel better, buddy--Mr. Spy was feeling ill as well. However, I feel just great by simply looking at the asparagus. One of my favorite foods, funny pee smell be damned! Thanks for all your kind wishes. This "thing" has hung on a bit longer than expected, but hopefully this nice weather will have me breathing easy very soon. All those plans can wait until next year or another holiday~hope you are over your illness by now. I have had sinus infections ~not fun! !